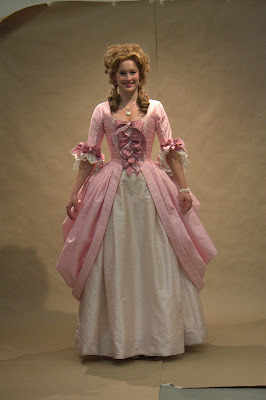 I thought that you might enjoy seeing a few more pictures of the dress that I created for CMU's production of The Rivals. Here are a few shots that were taken in a photo shoot on Saturday to document the dress. A view of some of the undergarments. The undergarments were not seen on stage but were still created of beautiful silk fabrics and finished to be beautiful both inside and out so that they would aid the actress in stepping back in time to the 18th century and in getting into character as Lydia Languish. The petticoat is of white silk taffeta. 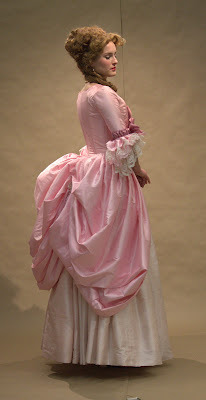 She wore an additional white silk taffeta petticoat underneath, along with her pink silk taffeta bum roll and white silk satin stays (lined in pink silk taffeta!). Just Beautiful! Thank you so much for posting up some photos of your amazing creation! Beautiful :) Thanks for sharing - I love the colours, too! Pink is my favorite color so I am just loving this for that and the 18th century fashion too. I am struggling with getting the proper look with my bumroll but I can't find any resources to detail what my goal is in the look. My gown seems wonky when I put the bumroll on. If you're allowed to do a post on that I'd love that! But I understand if that is copyrighted or anything. Also a friend who worked on this show last summer, across country, was chatting with me about how the costumes were styled to define the character. Hence I think the choice of pink (I think) for Lydia. That would be another fun post, on interpreting and dressing a character, if you are interested and allowed to. I know I'd love to read all that! So would my daughter who did a report one year on how she would style and interpret costumes for The Cherry Orchard by Chekov. That was a suggestion from my friend. The gown is extremely well done...you did a great job of draping it!